Show off your stitching skills and style with a customized cuff bracelet. Embroidering on leather or leather-like material can be tricky, but not when you start with a blank cuff that's designed for stitching. These pre-punched cuffs require no prep work, but since they're largely used for cross stitch, you will need to work a little differently. This tutorial shows you how to embroider a cuff and offers 3 free patterns to get you started. Hand-embroidered accessories are fun to wear, and even more so when you make them yourself. So grab your supplies and start stitching! The stitchable cuff shown in this tutorial is made by DMC and was provided by them for this project. However, other companies make similar bracelet blanks that will also work. You should be able to find options at craft suppliers locally or online. Pre-punched bracelets are typically designed for counted cross-stitch, so the holes follow a grid. Because of that, even when embroidering, it's easier to follow a pattern that's in chart format. Download and print the charts, or follow them on your screen. Each of the squares on the chart represents a hole in the grid of the cuff. These charts are designed for a bracelet with a 10x35 grid, but you can adapt them to fit other cuff sizes. The patterns represent waves, a feather and a knotted friendship bracelet, while also having an abstract feel to them. Choose colors similar to those shown, or different shades to match the color base of the bracelet you're using. The stitched example uses six strands of embroidery floss for a bold look, but you can use fewer strands or perle cotton if you'd like. Before you start stitching, coat the embroidery floss or perle cotton with thread conditioner. As the thread passes through the punched holes, it will get extra wear, so this coating helps prevent it from breaking down. As you begin embroidering, you won't be able to start with a knot, as it would slip right through the first hole. Instead, leave a tail on the back, covering and catching the tail with your first few stitches as shown above. This is similar to how a waste knot works, but without the knot. After you've worked some of the design and need to start a new thread, secure the start by weaving the thread through the back of the embroidery. When you reach the end of a length of thread, secure it by wrapping and weaving it through the back of your stitches. It's a good idea to avoid jumping between areas, while also not starting and stopping threads too often, which can create a bulky backside of the cuff. While you can use a variety of simple stitches on a cuff bracelet like this, for the lines in the patterns, back stitch is best most of the time. In the sample above, there is a back stitch between each of the holes, both straight and diagonally on the grid. But you can also take longer back stitches. Use the length of your stitches to add variety into your embroidery. As you work, you may find it helpful to flip back and forth between the front and back so you can see the hole where you are sliding the needle through. Sometimes it will make more sense to work stitches more like straight stitches, rather than back stitches. Especially on longer lines. Follow the patterns in the way that makes the most sense to you. Just be careful that the stitches aren't so long that they might snag on things. 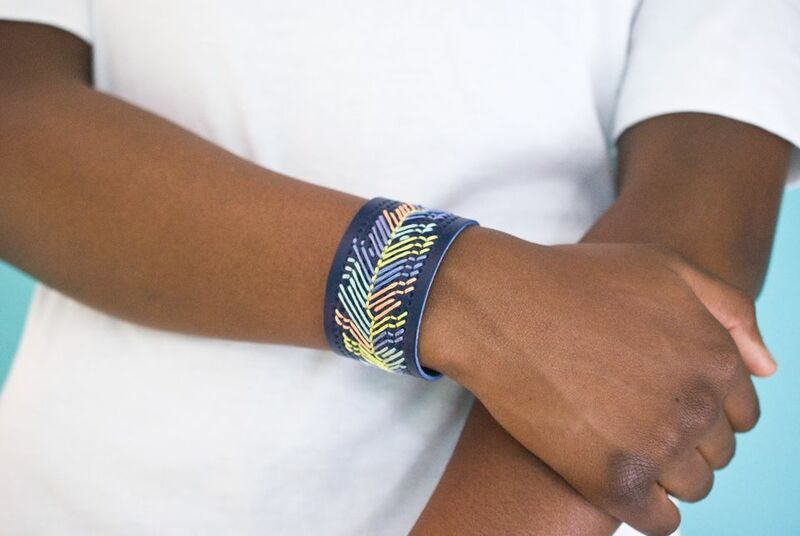 Check that all of the threads are secure on the back, then wear your new custom cuff bracelet to show off your stitchy side!